Both gubernatorial candidates agree that Arizona’s economy is not performing well, but they don’t agree on what to do about it. Republican candidate Doug Ducey likes to ask audiences how many of them are from somewhere else, and of course, some people always raise their hands. Ducey’s conclusion is that because of Arizona’s great weather, people will continue to move here– despite the shortage of good-paying jobs (and water). Tourism, transplants, and related services have made money for Arizona and will continue to do so, Ducey contends. As Democratic Party candidate Fred DuVal aptly points out, Ducey’s plan is based upon “tooth fairy economics” (AKA trickle down economics). Although DuVal is sometimes vague on specifics, at least he doesn’t rely on magical thinking to solve Arizona’s economic woes. In debates and speeches, DuVal talks about growing local small businesses to re-build Arizona’s economy, vows to repay what the Republican Legislature stole from the schools, ties a strong public education system to economic expansion, and suggests student loan relief for teachers. Across the country, states and cities have billions of dollars sitting in rainy day funds that are held by Wall Street banks, such Bank of America, Chase, or Wells Fargo. Taxpayers don’t benefit from the money held by these big banks because when Wall Street banks invest our money, they invest it on Wall Street, and the profits go to their shareholders– not to the states, cities, or citizens. If Arizona had a state bank, it could lend money at low rates to cities and counties for infrastructure projects. If the state bank of Arizona loaned the City of Tucson $100 million at 2%, the state (not Wall Street investors) would make money on the deal, and Tucson would save tens of millions in interest payments. Think of all of the crumbling infrastructure around our state– particularly in rural Arizona. Roads, bridges, schools, community hospitals, public buildings, and even the crumbling rest stops on the freeway could be fixed, improved, or replaced with local infrastructure loans from a state bank. And what about that commuter train between Tucson and Phoenix? It would be far more affordable to build that with state funds, than with borrowed funds. You might say a 2% interest rate is too low, but remember, the state is actually paying fees to Bank of America to hold our money; Bank of America is investing taxpayer funds and keeping the profits; cities are going into debt; and our state has a crumbling infrastructure that is not attractive to business development. A lose-lose-lose-lose situation for Arizona. With a public bank, Arizona would save the money it is now paying out in fees to big commercial banks; the state could make money on loans to local governments; the local governments would save money (which could be spent other ways); the citizens and local businesses would benefit from a strong, reliable infrastructure; and Arizona would be a more desirable place for businesses that want to relocate or expand because we would have a modern transportation system and reliable infrastructure. A win-win-win-win-win situation for Arizona. 9 Provide good-paying jobs. All politicians promise good-paying jobs. Public banks can provide those jobs. Looking at #10 above, all of those publicly funded infrastructure projects would need workers to build and maintain them. State and local governments will need college-educated office workers to write the loans and manage the funds. Businesses and services that thrive thanks to the reliable, modern infrastructure will need employees. Public banks like the Bank of North Dakota help local businesses grow by offering expansion and start-up loans to existing local businesses, entrepreneurs, and farmers. Public banks can offer these loans directly, or they can provide funds to local community banks who do the lending (thus strengthening the businesses who receive the loans and the community banks who make them). The City of Tucson currently has a Community Banking Project which offers loans to local businesses through the Alliance Bank of Arizona, a community bank. In 2013, at the urging of Move Your Money enthusiasts and public banking advocates from Progressive Democrats of America (PDA) Tucson, the City Council deposited $5 million of the city’s rainy day fund in Alliance Bank for local loans. (Press release from Local First here.) In April 2014, the president of Alliance Bank reported back to the City Council on the status of the loans. (City Council video here; scroll in to about 38 minutes to hear the report.) With the $5 million, Alliance Bank made 16 local business loans– $9 million in local investment– in seven months. In the City Council meeting video, the community bank president gushes about how well the Community Banking Project is working. As a result, the City Council voted to expand the project to lend $10 million. Tucson’s Community Banking Project is a quasi-public-banking experiment because it uses government funds to foster Main Street economic development through community bank loans. Here is a comparison of the economic health of North Dakota and Arizona. 7 Strengthen Local Community Banks. Public banks not only strengthen businesses by partnering with community banks to make low-interest loans, they also help community banks thrive. In the graphic here, the overall economic health of Arizona is compared to that of North Dakota (a state with a population roughly the size of Pima County). 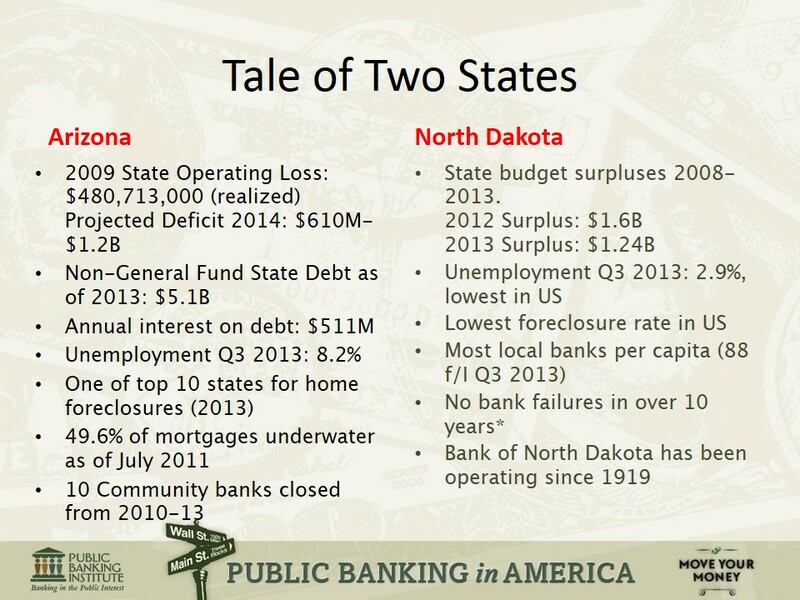 North Dakota has had no bank failures in 10 years; Arizona lost 10 community banks in three years (2010-13). Public banks help local financial institutions; they don’t compete with them. 6 Offer Low-Cost Loans to Arizona College Students. It’s no secret that college is expensive, and many people graduate with crushing student debt. The Bank of North Dakota has an affordable student program and other college financing strategies for North Dakota residents. 5 Strike Debt to Help Citizens. Hundreds– if not thousands– of Arizonans are paying off college loans. Depending upon the amount of the loan, who lent the money, and what the interest rate is, some everyday Arizonans are paying as much as $500 – $1500/ month on their student loan debt. Given that Arizona is a low-wage state, this is a significant portion of someone’s income. With that level of debt, people can’t buy cars or houses or start a family. Some student loan debt is not excusable by death; if you die, your estate, your spouse, your children, or your co-signer will have to pay off your student loan. Public banking could reduce student loan debt by buying up debt and excusing it (as Strike Debt is doing) or by buying the debt and refinancing it with loans directly from the public bank or loans issued by community banks and backed by the public bank. The same process could be used to help citizens with underwater home mortgages. Consumer debt can be purchased for pennies on the dollar. What a boon to local and statewide economies if 1000s of citizens had ~$1000 more to spend each month! This wealth would flow through the state– rather than flowing to Wall St. banks to pay off debt. 4 Pay Back the Schools and Fully Fund Education. During their austerity push a few years ago, the Arizona Legislature ignored a state law that outlines how k-12 schools should be funded. Now the courts have ruled that the state must pay back millions of dollars to the schools. Ducey wants to avoid paying back the school system and has suggested changing the funding formula. DuVal– who has been running as the education candidate– has vowed to pay back the schools because he believes we need to fix education before we can fix our economy and become more competitive. Revenue generated by public banking could be used to fund public education in Arizona. 3 Act as an Incubator for University-Based Spin-Off Businesses.Arizona’s three universities are incubators for innovation. They are gold mines of creativity, and they are being ignored as economic development engines and job-creation centers. Under the current system, if University of Arizona professors discover a new drug or invent a new medical device, they seek venture capital (on Wall Street) to bring the drug or invention to market. What if they could get low-cost capital through a community bank and backed by a public bank? To date, the largest loan that Alliance Bank made through the City of Tucson’s Community Banking Project was $2.9 million to a medical services start-up, a spin-off from the UA. Research spin-offs strengthen the local economy and provide good-paying jobs for educated workers. 2 Protect Taxpayer Funds. The only state in the US that doesn’t allow taxpayer funds to be gambled on Wall Street is North Dakota. When the stock market caused a near worldwide financial meltdown in 2008-09, North Dakota was the only state whose economy didn’t tank because North Dakota’s money was invested locally. Remember the waves of austerity cuts that were made in Arizona and elsewhere to make up for lost revenue? That didn’t happen in North Dakota. Forty percent of the world’s banks are public banks; none of them failed during the crash. 1 Public Banking Is a Non-Partisan Economic Solution. Not unlike theNonpartisan League of North Dakota that created the Bank of North Dakota in 1919, the Tucson Community Banking Project has the backing of local businesses and community bankers seeking a vibrant local economy for business development– as well as the backing of progressives and faith leaders seeking economic justice for the people. In Arizona, progressives, Republicans, Democrats, and Unitarian Universalists have been collaborating and looking for coalition partners. When PDA Tucson began working on public banking in 2011, they didn’t realize that Apache Junction Republican Rep. John Filmore was preparing a public banking bill for the 2012 legislative session. PDA Tucson “reached across the aisle” to Filmore, they worked together on the bill, and PDA Tucson leaders even traveled to the Legislature to testify in favor of creating a public bank. Public banking was proposed again in 2014– this time by Southern Arizona State Senator Andrea Dalessandro and a group of 10 Democrats. Neither of these attempts made it out of committee, but we will persevere. Public banking is good for Arizona. To learn more about Arizona’s public banking initiative, check out Arizonans for a New Economy on the web here, on Facebook here, and on Twitter at @AzPublicBank. To learn more about public banking across the US, check out the Public Banking Institute here. 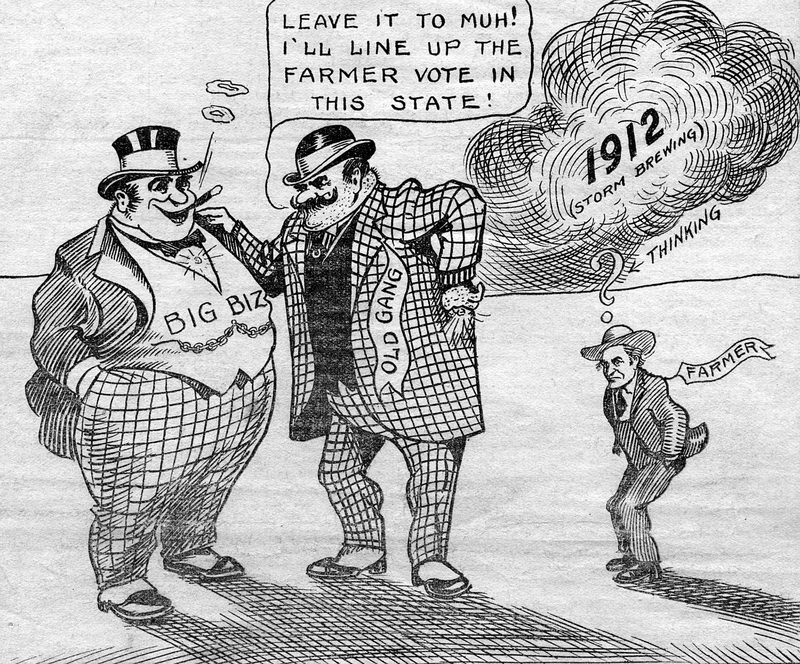 Public banking could save Arizona, no doubt about it…except…ARIZONA? Do you think they would really consider this if the whole slate won? Yes. We have already approached DuVal. He says he will listen if he wins. This is not a promise of action, but listening is good. People get it when they hear about it. Yes. He does actually listen – with the intent to hear. I really hope he wins. 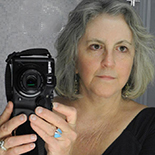 This entry was posted on November 2, 2014 by Pamela Powers Hannley in 2014 elections, Arizona, Arizona Legislature, Austerity, City Council, Democratic Party, Doug Ducey, Fred DuVal, Jan Brewer, jobs, Local First, Progressive Democrats of America, Public Banking, reform, Republican Party, Tucson, Video and tagged Doug Ducey, Fred DuVal, public banking, Public Banking Institute.